The bull arab was originally bred to help hunters find and catch wild pigs. Ideally the breed would have the size and strength to stop larger boars as well as the stamina and speed to chase large game without tiring. 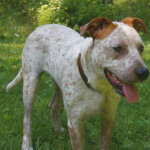 The original bull arabs were bred from bull terriers, greyhounds, and german shorthaired pointers, but many feel other breeds may have been used. 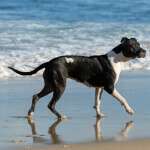 Below are the characteristics and traits of the bull arab dog breed. The bull arab is a large sized dog breed with males often exceeding 27 inches in height (from ground to shoulder) and 95 pounds in weight. Unlike many breeds, the bull arab doesn't have a set height and weight, rather the breed's size is supposed to be in proportion with their body. The bull arab is a kind even tempered dog breed. The breed does well with children and other dogs, but due to their high prey drive they may tend to chase smaller animals and livestock. 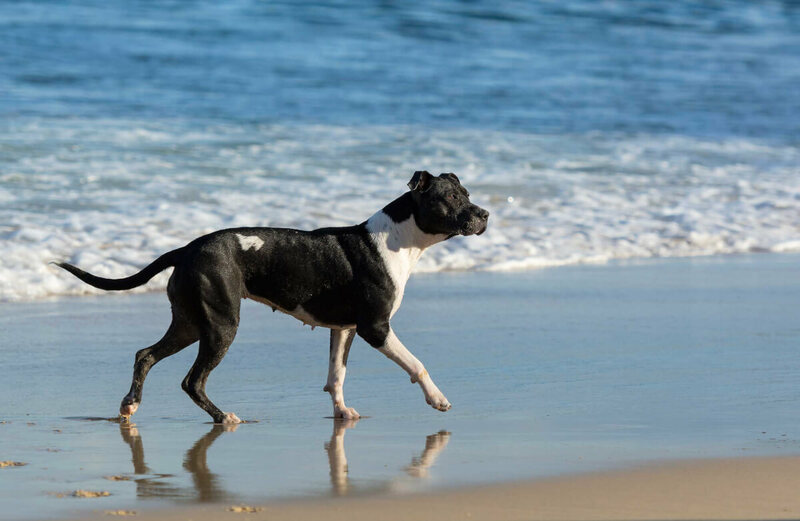 The breed is bold and overly confident so training is important to keep them out of trouble. 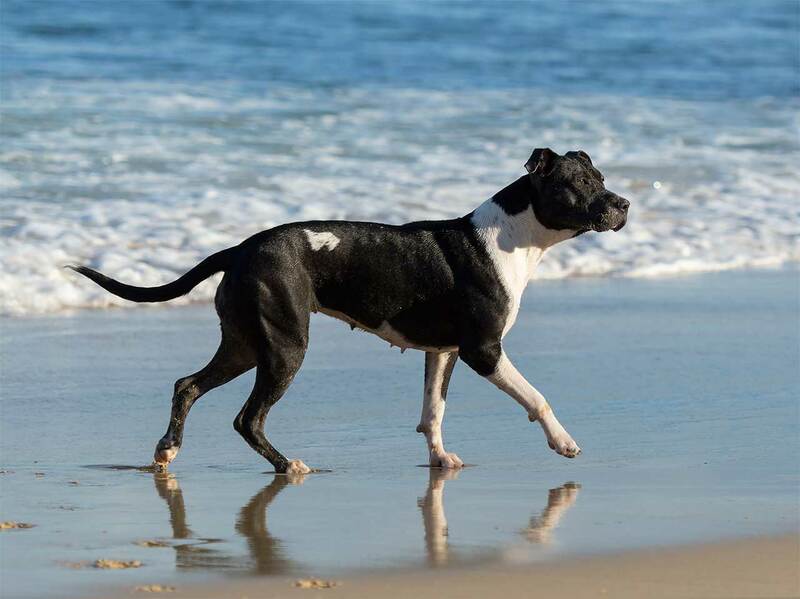 The bull arab is a resilient and active dog breed. Their coat is smooth and short which requires little upkeep. The breed is energetic and will need moderate exercise to keep them from developing unwanted behavior from hyperactivity. The Bull Arab history is a short one. This crossbred dog was first produced in the early 1970s when an Australian breeder named Mick Hodgens was apparently experimenting with finding a better pig and herding dog. 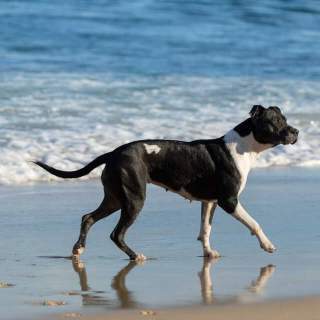 Initially it was thought that American Pit Bull and Staffordshire Terriers were used in the cross-breeding. Hodgens refused to state how the dog was produced, but DNA testing has allowed the "secret" to be revealed: 25% each of Greyhound and either German Short Pointer or English Pointer and 50% English Bull Terrier. A decade or so later, in the early 1980s, Hodgens stopped producing Bull Arabs. After Hodgens stopped, other breeders stepped in and perfected the dog, making it the top-rated pig-hunting dog in the land down under. It is believed that one breeder in particular, Peter Paulsen, added 1/8th-Bloodhound to sharpen the dog's scent ability as well as increase the stamina and harden the foot pads. Not all Bull Arabs have Bloodhound in them, however, and so you can seek out one with or without the scent hound inheritance. These days, this hybrid hunting dog is rarely found outside Australia. The Bull Arab is a medium- to large-sized dog that is bred less for looks than the speed and power required to find, chase and kill wild boars. Nevertheless, a healthy and well-maintained Bull Arab will exhibit a significant appearance. Some will have docked tails but those that don't will have a long one that is late at the base and tapers down to a relatively fine point. The short, sleek and smooth double-coat is perfectly suited for the often hot days in the Australian outback. The dog's coat is highly resistant to the many bugs and parasites that dwell in those regions where they hunt. These dogs have somewhat bald and slightly mysterious eyes, large ears that droop and a very strong head overall. That strong head and set of shoulders is connected — with a slightly arched neck that indicates fiercely coiled potential energy — to a sturdy, tall and muscular body. This finely balanced dog will have rear legs that are clearly meant for long bursts of fast running as well as digging in when it gets hold of its prey. There tends to be a high demand for the liver nose Bull Arab, but other than the coat (and nose) color, this doesn't appear to be a variation of the Bull Arab so much as a highly sought coat color. Bull Arabs tend to be white or cream with darker patches, but there are black Bull Arabs as well as the much-desired liver Bull Arabs. 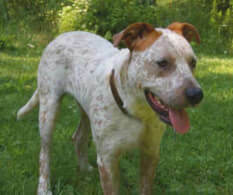 This latter color almost always has a liver or red nose, and this feature is often advertised due to the desire for these dogs. While it is possible to find a black Bull Arab or a white Bull Arab that are just that one color, those whose color is said to be blue or liver are not like the all-black or all-white dogs, as they will probably have white with the blue or liver patches. The brindle Bull Arab seems to be less frequent than the liver Bull Arab, but the liver-colored dog is typically the more coveted color. The Bull Arab size differs between male and females. The adult male Bull Arab stands about 25 to 27 inches and will weigh from 70 to 90 pounds or slightly more. Mature female Bull Arabs are a slightly less at about 24 to 26 inches in height and will weigh between 65 and 85 pounds. The number of variations of Bull Arab tends to be anywhere from three to five. Save for outright size and a feature or two, these variations may be minute to all but those who breed and use Bull Arabs for pig hunting. The "original" Bull Arab was later basically split into two variations: those in New South Wales (NSW) that are a bit bigger due to having had English Mastiff bred into them and those in Queensland (QSD) that had Bloodhound introduced to the bloodline. The NSW variety were made larger (and had their tails docked) to deal with the region's Mountain Pigs whereas the QSD sort were made to have a better scent ability. A further split in the QSD variety is said to be those known as Paulsen Bull Arabs and those called Fortini Bull Arabs. There are also those that remain the originally produced variety, but these seem to be in short supply as they are believed to be inferior to the later-produced varieties described above. The Bull Arab temperament is a tremendous one. This somewhat inadvertent hybrid dog is rarely found outside of Australia. They are high-energy working dogs that require a lot of specific training to curb the dog's extremely strong hunting instincts. If you are determined to adopt a Bull Arab, however, it should also be noted that these dogs — if trained and socialized precisely, carefully and from very early on — can be wonderful family pets. Despite their drive to hunt, they are remarkably calm dogs when not on the trail of wild boars or errant sheep. They maintain an even temper (until they get the scent of wild game), and if you are not prepared for this scenario, a Bull Arab may not be the dog for you. In the hands of expert dog trainers, they can be top-notch search-and-rescue dogs. 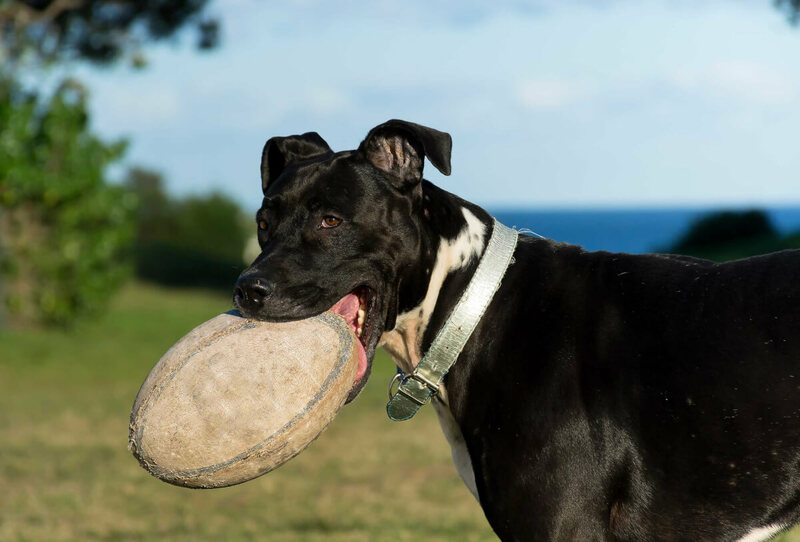 Those of you who have experience with dogs but may not be professional trainers may still be able to enjoy this dog's versatility (and companionship alongside that) as a watch- and guard dog, unending stamina and desire to play until the cows come home! The Bull Arab can be a great family dog if you are ready to expend the resources required to maintain and monitor this dog's behavior. They are not directly dangerous to kids and other family members; left unchecked, they can become a financial liability if they are allowed to chase other animals, wild or otherwise. Unlike most fierce hunting dogs, however, the Bull Arab temperament regarding children is basically wonderful. They are loyal, they make good watch dogs and are even better guard dogs for your kids, property and self. Should you adopt a Bull Arab, it may simply be better if you have no other pets nor live where wild animals abound — unless you are prepared to properly exploit this phenomenal hunter's prey drive. In Australia, they are widely known as Bull Arab pig dogs for a reason: these dogs have no problem chasing, treeing and even killing wild boars. When supervised, they can be trained to remain relatively calm around other animals. If you live in a rural or semi-rural area where wild animals may be present, and you haven't got a very high and secure fence, you may be asking for trouble if you allow a Bull Arab to get away from you. They will chase animals larger than themselves including cattle and any smaller animals — which is why having other pets in the home is not recommended. Below are pictures of the Bull Arab dog breed. Bull Arab dogs as pets are not very well-suited for apartment living. Even with modest homes, they require a lot of daily exercise (more than most dogs) and will desire more than a fair moderate amount of space to run and play. Indoors, they tend to be not as active, and while this may seem ideal, it is not at all good for the dog's health and state of mind.